Well, as you can see, I have finally finished Oor-Flap Muts, modelled here by my biggest boy. I used Sirdar Click with wool (aran weight) and used just over a skein of each colour, which as it was in the bargain bucket in my LYS, I feel it was money well spent....plus its very cosy for the cold weather that seems to have landed in these here parts. 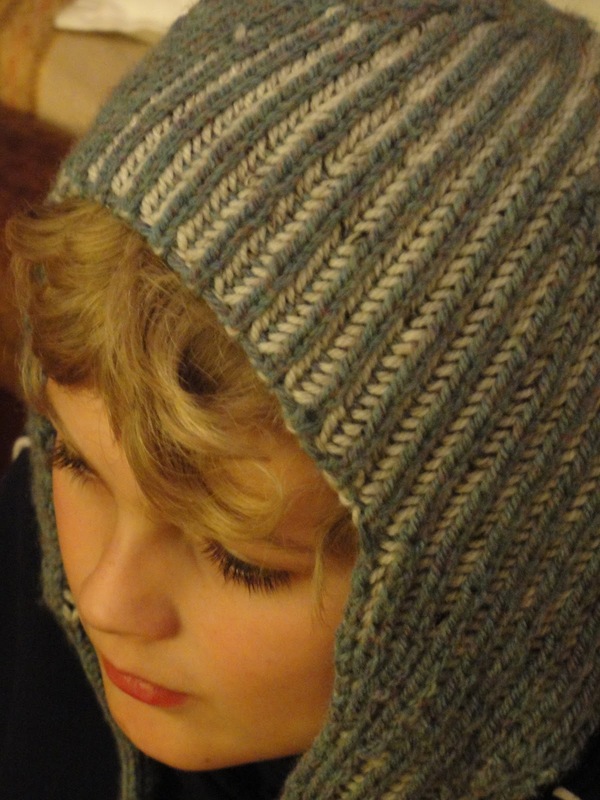 As it is Brioche knitting, it is fully reversible, a two sided thick and toasty fabric. The light in the photos is maybe not the best for seeing the project at its clearest, however, I couldn't stop taking pictures as my biggest boy looks so beautiful in the light from the fire......maybe beautiful isn't a word that should be used about a boy....but he's just that....set to break a few hearts I think! Biggest boy is not the only one enjoying the fire....we call this pose upside-down-head....I think it means she's relaxed! Right, better get going on boy's bedtimes, which are a little later than normal but as its the start of the half-term hols tomorrow (YIPPEE!) that's not too important. What a wonderful & cosy hat & your son looks very handsome too. 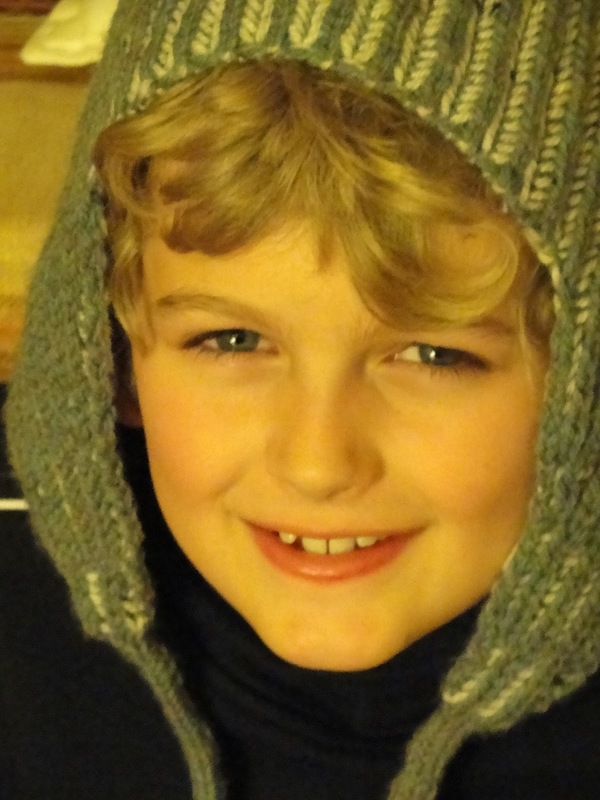 That hat looks very cosy to wear and looks very good on your son, and I wish I had a cosy fire to curl up in front of as well! The hat looks great and the fact that it is reversible is very cool. He looks wonderful by the fire, I can see why you'd post the pictures. Heart Breaker for sure!!! The hat looks so warm and cozy and while it hasn't been freezing here yet, the damp has arrived and makes us feel colder than it is. 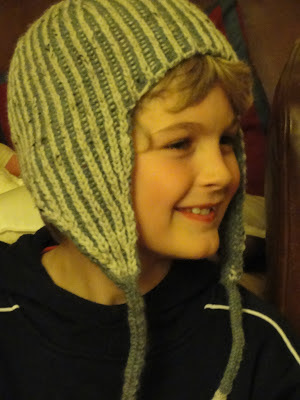 I wish I knew brioche knitting as I think my Sam would love a hat like this. Well done! You're right - he does look beautiful. So does the hat. It's getting cold here too and we're heading to visit grandparents over half term so I'm expecting more cold and rain! I completely agree he is a very handsome boy, sure to be a very handsome man! Looks as if the hats were completed just in time, the weather seems to have turned very cold of late. Oh wow that hat is great, and being brioche and reversible will be so warm this coming winter. It has turned decidly chilly here over this last week so I think our hats and mitts shall come out soon lol. I think beautiful is ok to use with boys...well once they don't hear you lol, my bigger boys don't like it lol. I hope you get time to do your cake this week, I'm so looking forward to this coming week and no racing to the clock. My third cake is done so now I've just to boil my puddings which have been sitting for the last 24 hours. I will soon move onto the mince pies, I'm hoping to make and freeze some, something I've not done as they've been devoured before I get to freeze any ! The recipe works great all year with homemade jams or curds as a filling instead of mince meat, I did mean to say that to you. My eldest was my only baby to come early and he is still like that, has to be everywhere first lol. The rest came pretty much a day either side of due date or up to a week late so I'm gearing myself for nearer to the 20th of Dec, then anything before that will be a treat, you know how those last few days are!! I'm trying to avoid that by thinking further, if that even makes sense. I hope you enjoy the week and I'm sure it will fly by! Beautiful is a perfect way to describe that gorgeous face. Love the knitting, too. Hi Faith...Your boy is beautiful indeed...in fact I was distracted from looking at your hat project because the photos are just so lovely!..I do love the hat though and it will be perfect and cosy for the cold days ahead..now you need to knit lots more designs as you have the perfect model right there at hand! P.S Sorry I must have been so distracted by the lovely pics I put my comment in the reply box by mistake! What a lovely hat. I think it's totally fine to call any child beautiful, all too quickly they grow up so you are right to savour his childhood. Enjoy the hols - and nice job on the hat too! Such interesting texture to that stitch. Hide your daughters..didn't even notice the hat! Perfect name for that kitty pose! The hat looks fab... so cosy!! Your blog posts are such a celebration of all that is beautiful in life, boys included. I LOVE the hat! Must look into brioche knitting.